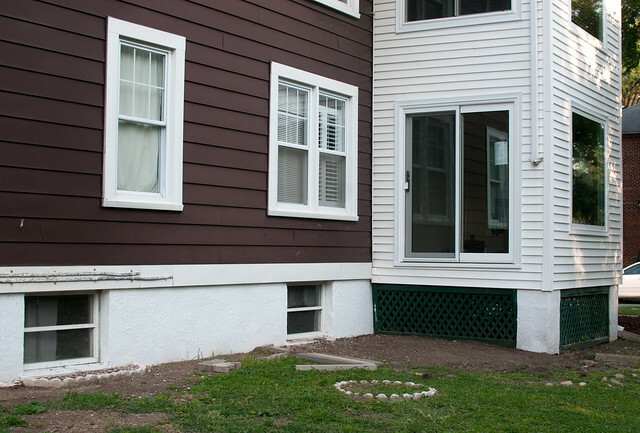 In our last post about Tim and Dawn’s outdoor space, we showed you the before pics and plans to completely overhaul their corner Rosemont lot. 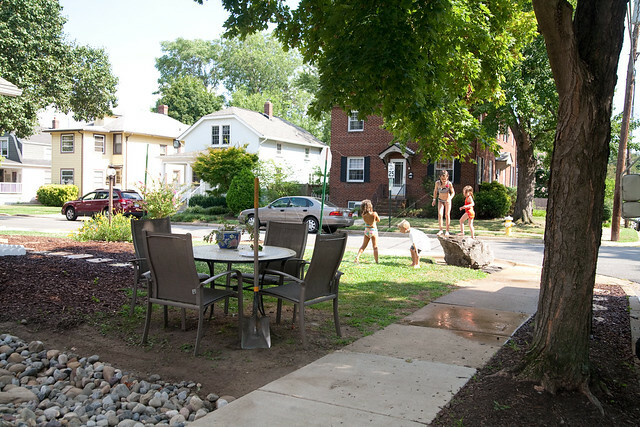 We’re back today to give you a look at their progress of turning a neglected yard into an attractive and functional space for their active family. 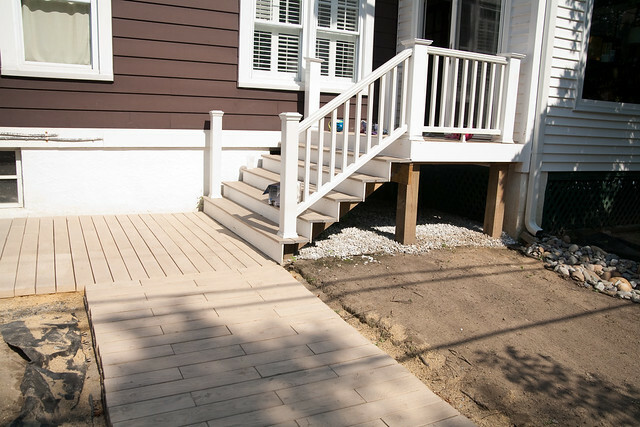 After building a small deck landing, Tim sought the city’s approval. 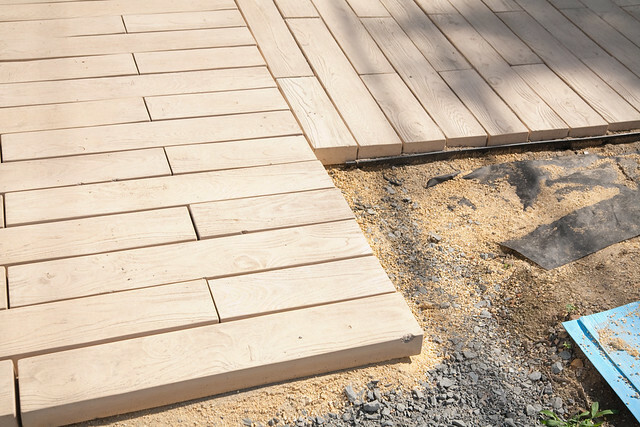 He was proud to learn that the city code administration not only approved the small deck landing he built, but they told him that the quality of the work was as good as a licensed contractor. 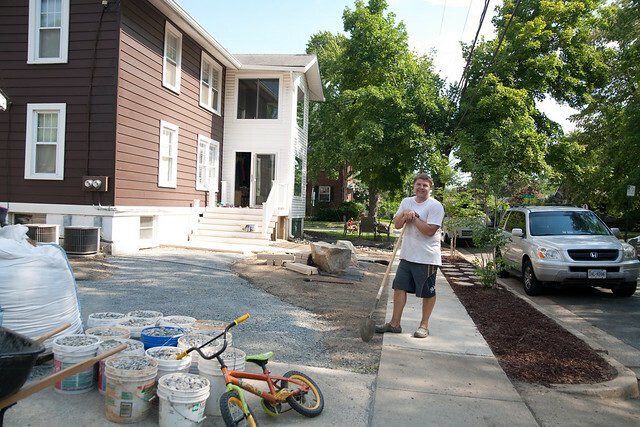 Here’s what the home looked like before Tim built the deck. 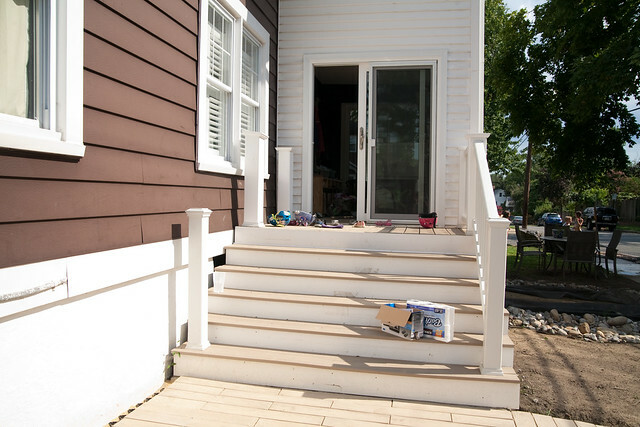 Tim still plans to place LED lights on the steps, another side rail up the stairs, and a bench for the kids to sit on when taking on and off their muddy or wet shoes. 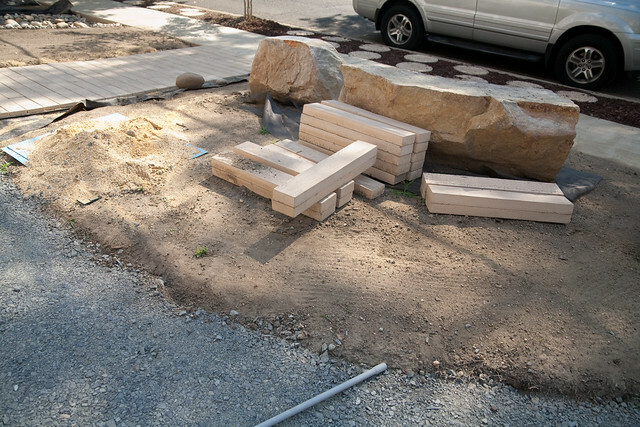 To give the appearance of a beach boardwalk, Tim bought 500 sq. ft. of stone pavers. You may remember how Dawn wanted to evoke a beach house feel in her interior design. Her vision extends to the exterior hardscaping too. 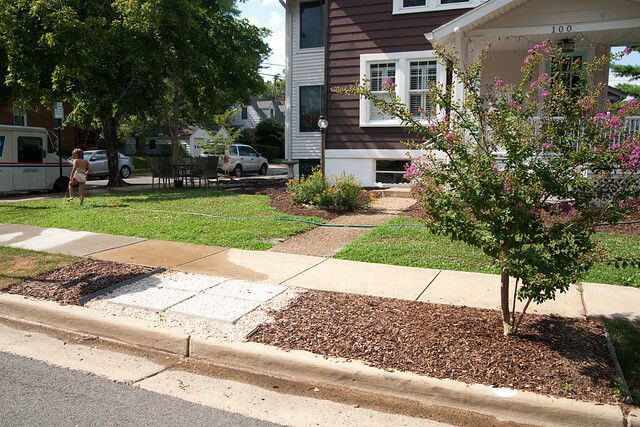 Tim started from the sidewalk and plans to run the paver along the house to the driveway, and then connect with the rest of the yard. 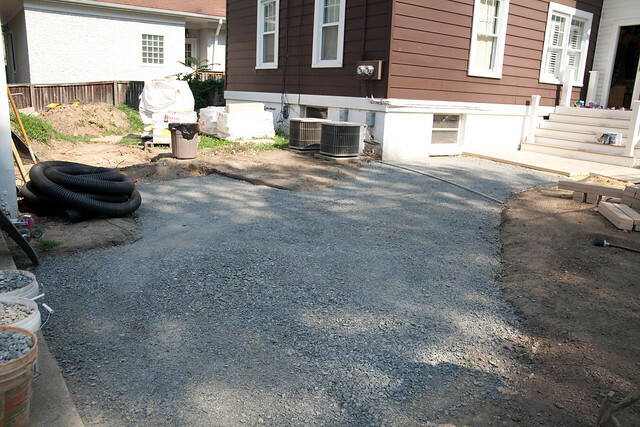 He dug about 9 inches of dirt through the pattern, making room for around 6 inches of gravel, an inch of sand, and 2 inches for the depth of the paver. 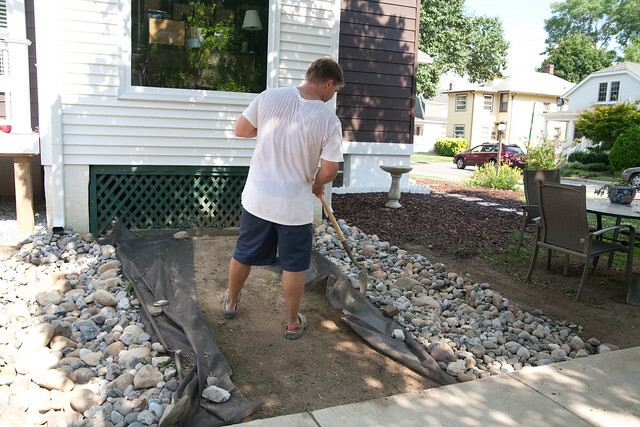 He says it is also critical to have the gravel go approximately 2 or 3 inches on each side of the pattern in order for the paver edging to be pounded into gravel, and not into the dirt where it can shift. He’s awaiting a back order of some borealis techno-block edging. Along the side of the deck, off of the down spout, Tim created two dry river bed creeks. 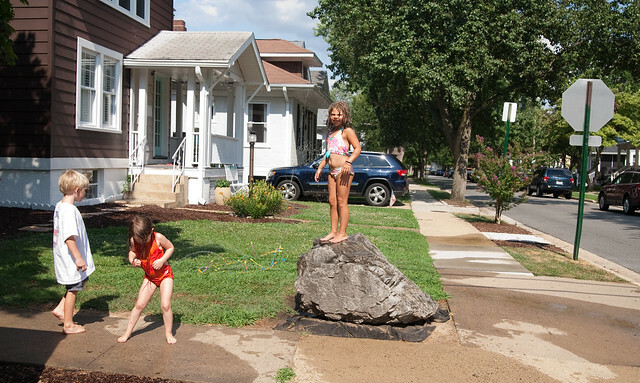 They’ll look pretty when there is no rain and will also be functional to control water flow when it rains. He added small rocks to complete the look. He’ll later create two mini-bridges over the river bed for a rustic look that will also be fun for the kids and grown-ups to use to get from the back to the front yard. 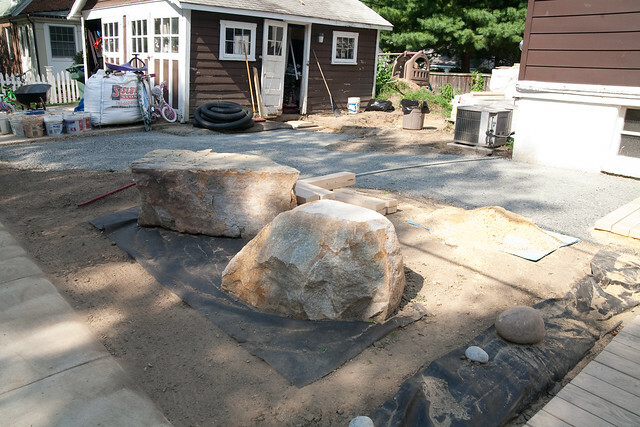 Tim and Dawn picked out a few accent boulders from Sisler stone when they ordered the pavers. They intend to finish the look with tall grasses, mulch, or peastones, and LED lighting. We’ll be back again to see how things progress. If you ask Tim and Dawn, they’ll say that even though they’ve come far, there’s still much more to do.